Congratulations to "Cristina A", the winner of Anne Marie's giveaway. Thank you to all who participated! You may have heard the John Donne quote, “No man is an island.” Basically, it implies that relationships are what make humans thrive. The variety of bonds in our lives—familial, parental, romantic, social, and societal—are meant to support us. DEADLY BONDS, the third book in my Mindhunters series,released this week. Writing it was an interesting challenge as I focused onthe various types of bonds my characters had, and how those ties impacted them. Some of the bonds strengthened them, and others pulled them apart. The heroine, Sara, is the director of a private school where she sometimes has to act as a counselor to her students. The place, and the people, is like a second family to her. But the bond she longs for is the love she left behind a decade ago. The hero, Holt, is a mindhunter—a psychologist who profiles serial killers, delving into their dark minds. He is a widower and a father, still struggling to find a new balance after one of the bonds that shaped his life—his wife—died two years ago. For many reasons, he’s resisting forming another romantic tie, but he learns that the love Sara offers him can be a stabilizing force, and give him new purpose. He’s not the only one feeling untethered. Toxin, the killer in DEADLY BONDS, feels the world has let him down. He’s creating a new purpose for his existence, reinventing himself as society’s hero by killing those he deems unworthy.But when he learns Holt is hunting him, he finds the arch-nemesis every superhero needs…and a deadly bond develops. Bonds are what motivate us, what give life purpose. But they can also be wielded as manipulation. What types of bonds hold your life together? Which ones are strongest and most motivating? 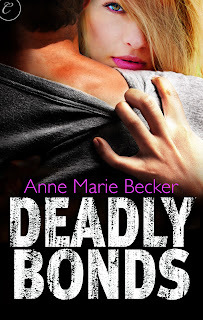 I’m giving away a digital copy of DEADLY BONDS to one lucky commenter. ***NOTE: The first book in the Mindhunters series, ONLY FEAR, is on sale for 99 cents throughout July at all of the above retailers. The types of bonds hold your life together are my friends, family, and pets. The ones that are strongest and most motivating is my mother and my friends. My friends will stand by me and offer me support. The strongest bond is my mother. My mother loves to manipulate my sisters and I into running her errands (*cough ..her biddings..cough*) every time she know that we are off. Kind of annoying but then again, mothers love those push buttons. I love that your mother makes you guys her minions. ;) And thanks for mentioning pets - great point!! So fabulous to have a family like that. Makes all the difference! Thanks for stopping by! The strongest bond I have is with my family... even though we have our differences... I always know that they will be there for me if needed. I've always thought family (especially siblings) can be a proving ground where we learn to work through differences - so glad you have people you can count on. There's a familiar theme here and that's family. However, family doesn't have to be traditional. When my father died many years ago, there was a coworker who became my lifeline. We didn't know each other well at the time but she reached out to me and helped me grieve when I was having to be the pillar for my family. I was able to be there for her in a similar way years later. We created a bond that will never break even though we now live in different cities. I'll never forget what she was for me at a terrible moment in my life and she seems closer than a sister! Love your reply, Jonetta...absolutely, family are the people you can count on, even if they're not blood relatives but the family you adopt as you go through life. Thanks for your comment. Right now I'd have to say family and friends. I would have said love a week ago but considering I'm going through a bad break up of a 5 yr relationship, I"m gonna have to reconsider that :) Thanks for sharing and congrats on the new release! Oh, no - sounds like a tough week! So glad you took the time to stop by - and glad you have family and friend bonds at a time like this. The strongest bonds in my life are those of family. The most important bonds in my life are with my family, my children, husband, parents and siblings. Hi, Maureen - sounds like you have a lot of beautiful bonds. Most important are My Kids, Husband & Family. What keeps me sane? My family (including the Boyfriend, when he's not driving me INsane), and my writers' group. The bond with my husband, of 40 years, even though he died last year, is still very much present. I have you on my reading list Anne Marie & have your first book. This sounds like a very interesting series.